The reason for this can be a little confusing to the average client. There are diamonds made for honing and polishing marble and others specifically for granite. Some diamond pad manufactures now have combination diamonds that can be used on both. But the price difference has to do with time, not diamond cost. Obviously, using different colors of one type of stone would be good, for example, black marble with white marble. If you are going to use different types of stone, they need to match in hardness. 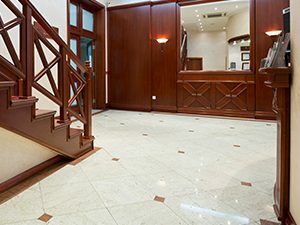 So, generally marble, onyx, and limestone can be combined and then later restored or refinished with little or no price difference from a single-stone application.